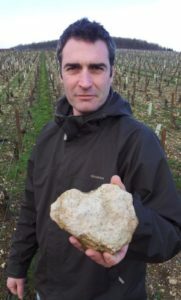 Guillaume Vrignaud is now the fifth generation that farms this 24 hectares family domaine, all planted very close to the tiny village of Fontenay-près-Chablis. The first planting was in 1955, on a small plot in 1:er Cru Fourchaume, but until 1998 all grapes were sold of to La Chablisienne. In 1999 Guillaume returned after the oenolog studies and a period in Jura, doing ’stage’ at Stephane Tissot. 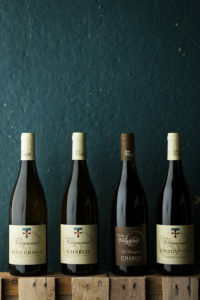 He felt since the start that to work more natural in the vineyards would enable him make wines that reflect their different terroirs more strongly, and to have a soil felt like a good insurance for the future. But, as it can be in family businesses, sometimes it takes quite a bit of time to convince the elders. It was not until 2010 he started to work fully organic and the domaine is certified since 2013. He is also since 2010 striving to make the vinification more and more natural, using only the natural yeasts, lowering the doses of sulphur and is using ’selection massale’ for all new plantations. He is very happy with the result – and so are we. We are very exited to be able to follow this guy in his work. The wines are intense in mineral, with prominent fruit with a fresh acidity, just how we want our Chablis to be. on the plateau below Fourchaume. Vinification: Direct press before fermentation and then aged for 9 months in stainless steel tanks before bottling. just next to Fourchaume, on the plateau and a north-east facing slope. just next to Fourchaume, south exposition. 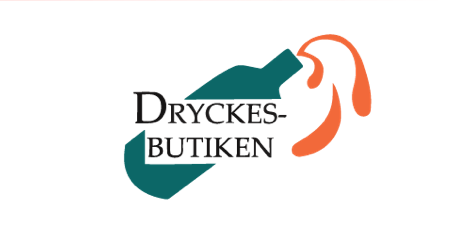 Vinification: Direct press before fermentation and aged for 13 months in 30% old 500-liter barrels and 70% in stainless steel tanks before bottling. 4,7 hectares south-east facing slope. 0,85 hectares south-east facing slope.